The largest H&M store in the world has opened at 589 Fifth Ave. in Manhattan. The stunning new temple of fast fashion -- a whopping 57,000 square feet -- has a museum-inspired vibe and boasts an immense five-story atrium, what seems like miles of marble, walls of mirrors and distinct herringbone woodwork. In addition to on trend clothing, accessories and shoes for men, women and children, the new fashion hub features a fancy concierge service (a first ever for the company) and the first New York location of a home department. 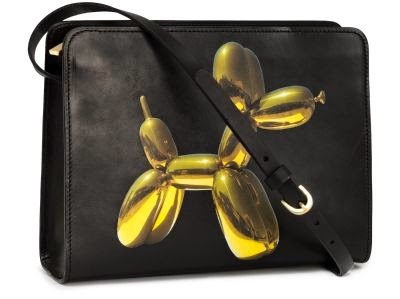 To celebrate, the Swedish retailer collaborated with legendary artist Jeff Koons, on what may be this season’s “it” bag, a specially designed, limited-edition leather handbag featuring the Balloon Dog (Yellow), one of the artist’s most iconic works, which retails for $49.95. An exhibit by the artist at the Whitney Museum of American Art -- Jeff Koons: A Retrospective -- is currently on display through Oct. 19. While the company has done collaborations with many high-end designers, it is the first time they have worked with a contemporary artist of this caliber. A small number of the bags are available at the museum as well and atwhitney.org. "I'm very happy to be working with H&M,” Koons said. “I'm very proud of the bag. Art is something that is accessible, we interact with it all the time and H&M makes fashion the same way." At the store’s opening party on Tuesday night, actress Olivia Wilde said, "It's so smart of H&M to pick an artist like Jeff Koons and to collaborate with the Whitney Museum, and vice versa. She added, “It's such a cool thing to have an iconic image on a piece of fashion -- it's says you are into art and fashion and it's chic." As for the bag, hurry, hurry, hurry. We’re guessing it will be gone, gone, gone before you know it.